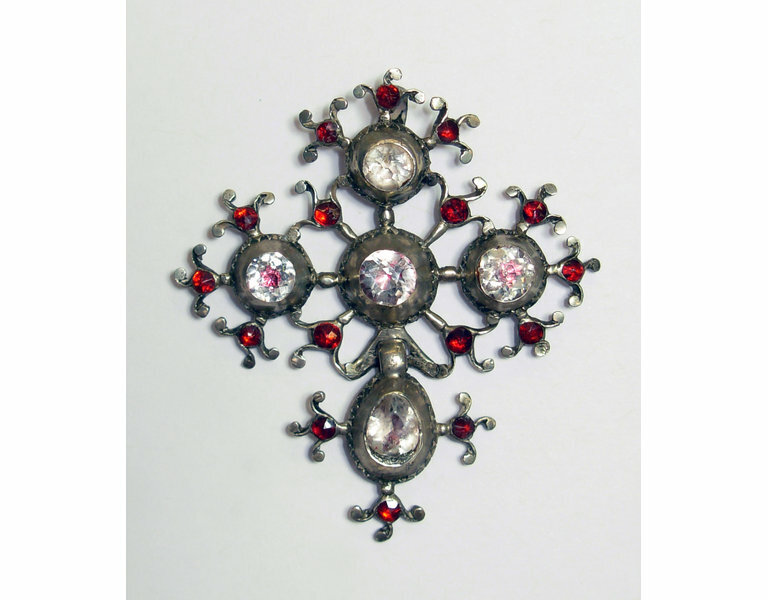 Crosses are the most distinctive element in French traditional jewellery. Every French woman owned one. They usually wore them on a black velvet ribbon, fastened tightly round the neck like a choker, with a slide at the front. The ribbon passes through the bale of the cross, and is then threaded through a hole or loop at the base of the slide, and out at either side. The ribbon is tied in a bow at the back of the neck. Normandy has the greatest variety of crosses, many with large and distinctive patterns, and individual names. Smaller kinds, like this one, are equally typical of the region, but do not have a distinctive name. The stones, which may be local Normandy crystals, are backed with red foil to give them a more interesting appearance. 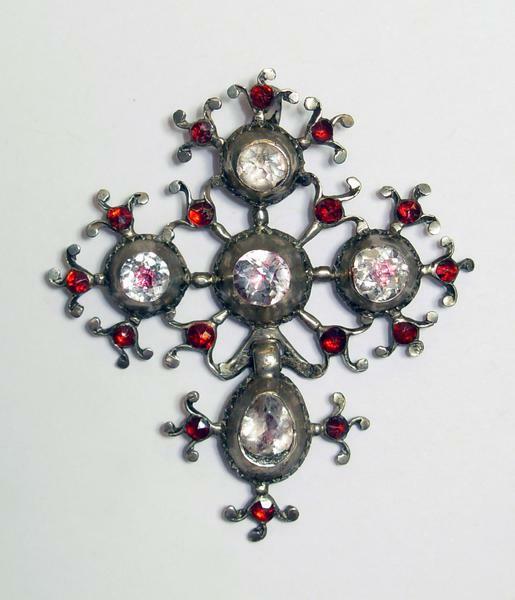 Stylised cross made from sheet silver pierced in a floral design and set with small red facetted pastes, with four high conical mounts set with larger circular white crystals over red foil. The lowest limb of the cross hangs loosely from a bar at the base of the main section, and has a central drop-shaped conical mount. There is a long hook for suspension on the back at the top. Partial mark of fasces with diagonal band, in shaped frame. Probably restricted warranty mark for silver, Provinces, 1798-1809. On suspension loop at back of cross, and on front of suspension bar at base of cross. Partial mark, possibly eagle's head in shaped frame. Probably Census mark for Provinces, 1809. On front of suspension bar at base of cross. 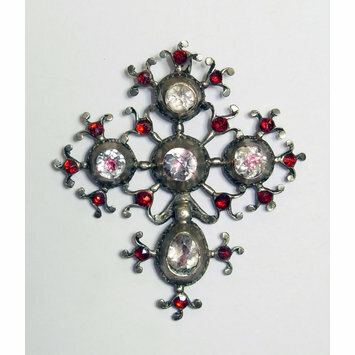 Silver pendant cross set with crystals backed with crimson foil, Normandy (France), 1798-1809.